In the solar PV sector, ACWA Power reports that it has reached financial close on three projects under Round 2 of Egypt’s feed-in-tariff programme II, with an aggregate capacity of 165.5MWp. The total cost of the projects is US$ 190 million, of which 75% is financed through non-recourse project debt from EBRD (European Bank for Reconstruction and Development) and ICBC (Industrial and Commercial Bank of China). The PV facilities, which are located at Benban, Aswan Province, will have capacities of 67.5 MWp, 70 MWp and 28 MWp, respectively. Construction of all the projects was expected to commence in Q1 2018. The government of Egypt has set a target of obtaining 20% of the country’s electricity from renewables by 2022. The feed-in tariff programme aims to secure an initial tranche of 2000 MW of solar capacity and 2000 MW of wind capacity. ACWA Power is partnering with the Chinese group Chint and the Egyptian groups Tawakol and Hassan Allam Holding on the projects. 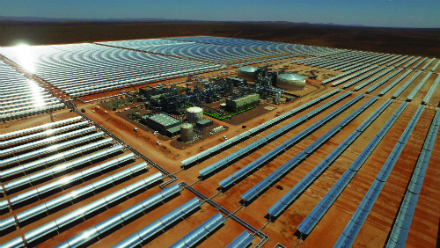 ACWA Power says it is also pursuing a number of other opportunities to consolidate its presence and support the Egyptian market, notably the Dairut 2250 MW CCGT project and a pipeline of more than 500 MW wind projects, 1 GW of PV projects and 100 MW of CSP projects. Meanwhile ACWA Power is adopting blockchain-based SolarCoin – the global reward programme for solar electricity generation – “marking the first time a utility-scale generator joins the SolarCoin ecosystem”, the company says. SolarCoin adoption will provide digital tokens to ACWA Power for every MWh of solar energy produced and will provide a means of payment for goods and services supplementary to conventional currency. The energy-referenced crypto currency (similar to Bitcoin) aims to incentivise global solar energy production by disbursing digital coins to verifiably produced solar energy, rewarding energy producers with digital tokens at the rate of 1 SolarCoin (SLR) per 1 MWh of solar energy produced, ACWA Power says, noting that “SolarCoin is global, decentralised and independent of any government” and that it uses an ultra-low-carbon blockchain technology called proof of stake time to maintain the open source ledger system. The proof of stake algorithm is significantly less energy intensive than methods used by other cryptocurrencies (eg, proof of work), says ACWA Power. As the price of solar coins appreciate, through more users agreeing to accept SolarCoin for value representation and transactions, claiming SolarCoins can become an additional and relevant revenue stream for solar power producers, ACWA Power believes, resulting in an incentive for solar energy investors to install more generation capacity. “We are always looking for ways to adopt new technologies to add value and reduce cost in all that we do and blockchain technology in our view offers an as yet untapped opportunity for the power generation sector”, observed Paddy Padmanathan, president and CEO of ACWA Power.